Grillz have been around for centuries, dating all the way back to the ancient times when the rulers and the wealthy used them to display their affluent lives. Nowadays, they are fashionable dental accessories. They were first made popular by popular celebrities such as Jay-Z and Kanye West, and they have been made into a popular icon of the hip hop and rap industry. Now, non- hip hop stars such as Kim Kardashian and Justin Bieber can be spotted wearing the infamous dental bling. From highly televised red carpet events to the small rural towns of America, gold teeth are everywhere. But are the gold grillz that everyone is wearing nowadays real or fake? There are two types of gold teeth that people can acquire: pre-made grillz or custom fitted grillz. First timers may think that there is not a big difference between the two, but they are actually quite different. Pre-made dental accessories are a standard size fit that is designed to fit most people. It is usually not made with real gold and in most cases are made from stainless steel or brass with a gold or silver coated plating. These items may have the outer appearance of gold, but it is not made with real gold. Because there is no real gold used, the cost for pre-made teeth are much lower. While some people may be thrilled with the thought of cheap teeth, the overall appearance is not as classy as custom fitted teeth. Pre-made dental accessories look plastic and fake, even from a far away distance. It also looks very bulky in your mouth since the design of the teeth is made as a standard size rather than a custom fit. Since the pre-made grillz come in a standard size, there will be no need to make an impression of your teeth. This means that you would just purchase a mouth piece to put over your teeth. While the thought of this may be convenient, there are many drawbacks from pre-made accessories. Pre-made accessories are very fragile and will not be able to withstand the teeth adjustment and fitting in the long run. The color will fade and tarnish rather quickly since it is not made with pure gold. There is a higher defect rate as opposed to custom fitted styles and since an impression of the teeth was not used to create the item, it may be highly uncomfortable for many. Since the accessory is made with a one-size-fits-all mentality and there are many shapes and sizes of teeth, it may not have the best feel and fit. 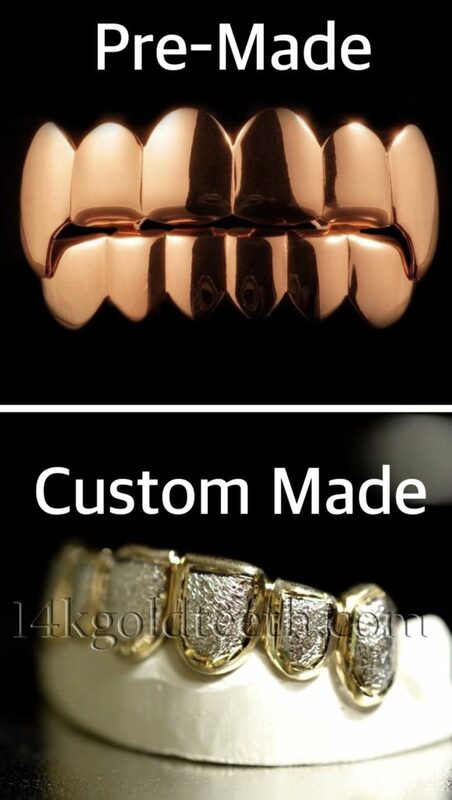 What are Custom Gold Grillz? At our company, we do not offer pre-made grillz because we value quality. Although custom grillz is more expensive, it has many pros as opposed to pre-made grillz. At 14kgoldteeth, we make the best custom grillz with the best price. Our gold grillz are all made from either real gold or silver. We do not use any type of plating or coating on top of our products. Since our grillz are custom made, it contains real yellow gold, white gold, or sterling silver. Custom teeth lasts much longer than pre-made teeth. All of our products are made with either 10k, 14k, or 18k yellow gold, 10k or 14k white gold, or sterling silver. All of our gold products have a stamp on the back to indicate its authenticity. We have a wide array of carat options for our gold products, with a lower carat number revealing the lesser amount of gold used in the product. Since our custom made products are made with real gold and silver, the teeth will not tarnish or fade as long as proper care is maintained. With the custom fit, the product will be far much more comfortable than the pre-made because an impression is used to make the grillz. The impression will capture the teeth shape and alignment so that the gold teeth will fit exactly on the teeth with a comfortable fit. It will be snug and secure, and most importantly provide comfort as opposed to the pre-made teeth. Although there is a higher price point with custom made teeth because of the higher quality of metals and materials, it is much better to invest in a product that will last a lifetime. For custom fitted grillz, the most important step is the fitting process. This step is crucially important as it will determine the final fit of your product. Because of this step, the time it takes to receive the grillz is slightly longer. Once a customer chooses his or her design, the number of pieces, and the type of metal on our website and places the order, our team will begin the fitting process. We send out a molding kit to the customer which includes 2 different colored putties, 2 trays, an instruction sheet, and return label. The entire process will take approximately 15-20 minutes, if done correctly. All of our directions are provided on our step by step instruction sheet, so customers will feel assured when creating their own impression. To first begin the impression, the two different colored putties must be mixed together to create one solid color. Then, the single solid color putty should be lined up onto the trays in the shape of a thin roll. Using fingers to assist in lifting up the top or bottom lip, the tray should be placed into the mouth onto the proper row of teeth and pushed onto the teeth. The putty should cover completely over the teeth and gums, and it should be placed in this position for 5-7 minutes without any movement. Once the time is up, the tray should be removed from the teeth without wiggling the tray as the slightest bit of movement can affect the fit of the gold teeth. These steps should be repeated until all of the trays have been completed with impressions for the rows of teeth that have been ordered. After all the impressions are completed, the trays with the molds should be rinsed off with cold water and dried, then placed inside the original bag. Using the return label provided, the finished impressions should be shipped back to us so that we can begin the design of your grillz and send back the completed gold teeth. While custom fitted grillz may have a more tedious process, the result is phenomenal. The finished customized gold teeth will be made especially for you that will fit perfectly inside your mouth. The design, look, and feel is all personalized so that no two grillz will be the same in the world. Anyone can get their own set of custom gold teeth from 14kgoldteeth, and we want each and every person to experience the sophisticated fashion accessory to his or her potential. How do you clean your grillz?